The Highlands at Broken Top is a stunning, luxury community every homeowner dreams of making their own. This elegant and stylish and desirable community offers its residents the finest in Oregon living. The Highlands at Broken Top is located within the city of Bend, Oregon. Downtown Bend is 5 minutes away from The Highlands. It is nearby William E. Miller Elementary and Summit High School. The Deschutes River and the old Mill District are now linked to this area by the Southern Crossing Bridge. The average sale price for these homes is $1,000,000. The Highlands at Broken Top is adjacent to the Broken Top Country Club. 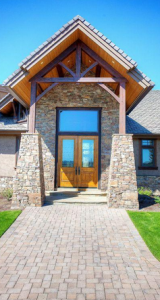 It is in the city of Bend, Oregon, located off of Macalpine Loop and Skyline Ranch Road. Bend is situated in the beautiful county of Deschutes. Deschutes is located east of the Cascade foothills, and many of the homes in the Highlands have great views of these gorgeous mountains. Over 59 K-12 schools service the city of Bend. Institutions of Higher education include the Central Oregon Community College and the University of Oregon, Cascades. The community has easy access to 39 acres of great parks and walking trails. Activities for the family include the Lava Lands Visitor Center, mountain biking, go for a horseback riding, and vising the Sun Mountain Fun Center. The West Bend trail is easily accessible from from the Highlands for walking and biking. It is located a few short minutes from Drake Park, fabulous shopping, and the Athletic Club. Music lovers can attend outdoor concerts at the Les Schwab amphitheater. In the summer residents enjoy activities such as biking, cycling, hiking, golfing, fly-fishing,, rock climbing, stand-up paddle boarding and rafting. Winter activities include skiing, sledding, snowshoeing, horse-drawn sleigh rides, dog-sledding at the Mt. Bachelor Ski Resort. There is something for everyone! The Highlands at Broken Top is one of the most desirable family-oriented communities in Bend with amazing views of the Cascade mountain range. It is Oregon living at it’s finest! The Highlands at Broken Top is a modern, upscale community with easy access to parks and trails. The families and residents of the The Highlands at Broken Top enjoy both its modern amenities and its abundance of outdoor activities.